Washington University surgeon Susan E. Mackinnon, recognized internationally for her expertise in nerve injury and paralysis, is accustomed to being confronted with real-life medical conundrums. 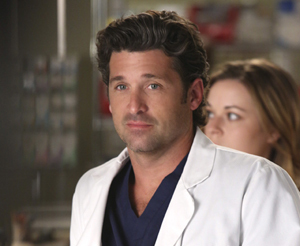 Actor Patrick Dempsey plays surgeon Derek Shepherd on the ABC medical drama Grey’s Anatomy. Washington University surgeon Susan E. Mackinnon advised the show on how to treat a serious hand injury suffered by the character. But recently, Mackinnon — the Sydney M. Shoenberg Jr. and Robert H. Shoenberg Professor, and chief of the Division of Plastic and Reconstructive Surgery at the School of Medicine — was presented with make-believe scenarios hatched in Hollywood. Mackinnon advised writers of the ABC medical drama Grey’s Anatomy on a storyline involving a lead character, surgeon Derek Shepherd (known to fans of the show as Dr. McDreamy). He suffers a hand injury in a plane crash and needs surgery. But when Shepherd returns to the operating room as a surgeon, it becomes apparent that his hand injury is worse than originally thought. Mackinnon, who pioneered nerve surgeries to return function to injured arms and legs, provided the show’s writers with information on nerve transfers and transplants, and pointed them to video footage of such surgeries on the university’s Center for Nerve Injury and Paralysis website. Grey’s Anatomy may use some of the footage in its upcoming shows, as they’re intended for educational purposes, Mackinnon said. “And I’m all for anything that elevates to a national level the public’s awareness of nerve injuries,” Mackinnon said. Upcoming episodes, beginning with Thursday’s show (Nov. 29) at 8 p.m. central, may reflect her advice. Mackinnon doesn’t know just which procedure the show will use, or what the outcome will be, but she said she was surprised and pleased with the writers’ medical knowledge and attention to detail. “They are going the extra mile to get the most up-to-date information,” she said. The show’s writers made contact with Mackinnon through the Hollywood, Health and Society program at the University of Southern California’s Annenberg Norman Lear Center, which provides entertainment industry professionals with information for health-related storylines. When Mackinnon received an email requesting her help, she didn’t hesitate to say yes.